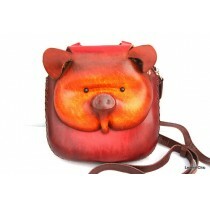 The small size leather animal bag are made out of premium cowhide and all handmde with excellent workmanship. The design features a 3D molded popular animal faces with a magnetic snap closure for safely storing small items and a long strap to be a crossbody bag. These bags are an excellent addition to any year round fashion trend and are great for day trips where fashion is always important, expecially for kids and teenagers.